Tammy365: 5 Positive Things about "Auto-Correct"
5 Positive Things about "Auto-Correct"
If you use technology, you've probably experienced auto-correct. Auto-correct is a built-in vocabulary that automatically corrects "supposed" errors. For example, I might be typing the word "of" and auto-correct changes it to "if". Lots of funny jokes results from auto-corrected text messages. Email uses it too. A lot of people hate auto-correct and they turn it off. Rightfully so, auto-correct has a history of ruining people's lives! Auto-correct has been known to turn the word "Disney" into "Divorce". You can see how this could present a problem...We're going to Disney becomes We're going to divorce! Is auto-correction really that bad? Here's my thought..."If you're God-connected, you're auto-corrected!" The Bible says in Proverbs 3:11-12 "My son, despise not the chastening of the Lord; neither be weary of his correction: for whom the Lord loveth he correcteth; even as a father the son in whom he delighteth." God gave us scripture for correction (2 Timothy 3:16). It's upsetting when a text gets corrected incorrectly! We don't need a machine correcting us. But we do need a Holy God to help us correct our incorrect ways. How many times have you turned your auto-correct off? Don't you love (maybe not) when you're thinking about eating a Reese cup and God says "Should you eat that?" and you're like "YAY! I should eat it!" You just turned off auto-correction. Have you ever noticed how difficult it is to get up on Sunday morning? Have you overrode your auto-correct and stayed in bed? I have! 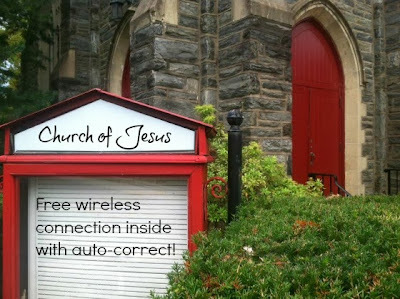 I couldn't do without my wireless connection to God complete with auto-correct. I don't have to worry about sending or receiving too much data, losing His signal or being charged extra. God's plan is free and doesn't require a new contract every several years! What do you like or not like about God's auto-correct? Share your thoughts with a comment below.